The TOEFL® Test is an International English test for students looking to further their education in a university or college where the teaching and interaction will be in English. At Pro-Match, we work with schools using the Institutional version, to test their students Academic English. For the official version used to enter Universities or apply for visas in various countries, please see www.ets.org/toefl. Registration phone: 00 60 3 7628 3333. ‣New Zealand Immigration and Visa - English requirement overview. Universities accept IELTS or TOEFL (see: University admissions). Registration phone: 0011 60 3 7628 3333. TOEFL iBT (or IELTS) is accepted by Universities and for most Skilled Migrant visas. 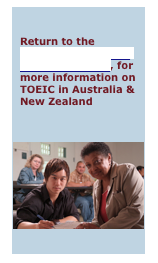 TOEFL iBT is not offered in Fiji. The official TOEFL PBT is available. 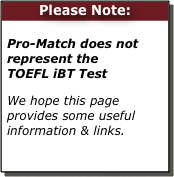 School test centres may administer the TOEFL ITP Test (for a school-administered “institutional” version of the TOEFL PBT). Follow the links for uses and limitations.